Out of 2000 international entries, John's portrait, "Avie" won a top honor at the Portrait Society of America's 2012 International Portrait Conference. Held in Philadelphia the conference featured presentations by Everett Raymond Kinstler, Burton Silverman, Nelson Shanks, and other nationally recognized portrait artists. John's painting, "Avie", won the Exceptional Merit Award and was exhibited at the conference alongside the other top 20 entries. 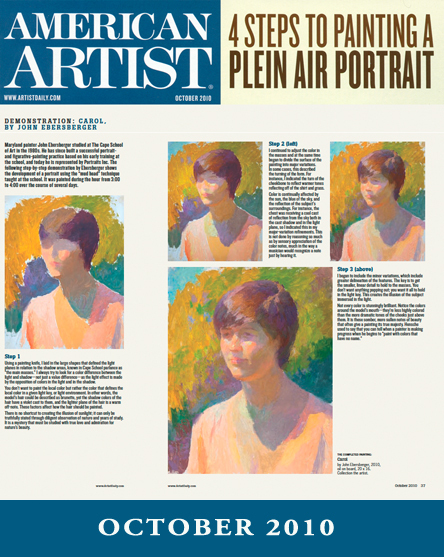 The October 2010 issue of American Artist Magazine features a step-by-step portrait demo by John to illustrate Michael Gormley's article, "The Artists Colony". In addition, John's painting "Anna" was a Finalist in the American Artist Magazine's Cover Competition. The winning painting is in the July/August summer issue. Downloadable PDF files of both articles are available on the Publications page of this website. Competing in 2009's Paint Annapolis event in Annapolis, Maryland brought John top honors - "Best in Show" was awarded to "Chesapeake Girl" by juror Ken Backus. John was awarded the Certificate of Excellence by the Portrait Society of America at the10th Anniversary Art of the Portrait Conference for his portrait, “MacKenzie. The event was held in Philadelphia in April, 2008. Expressing the full spectrum of nature’s beauty, John’s paintings reflect the twin strains of Impressionism and Classical Realism. After earning a BFA from the Maryland Institute College of Art in 1977, he began studying under Cedric Egeli, the nationally known portrait painter. It was Egeli who introduced John to Henry Hensche, the master impressionist who had served as Charles Hawthorne’s teaching assistant in the 1920s in Provincetown, Massachusetts. Struck by the intensity of light Hensche was able to achieve in his canvases John studied every summer with him until his death in 1992. John’s work and articles have appeared in The Artist’s Magazine, American Artist, American Art Collector, and Workshop Magazine. Books containing John’s work include Capturing Radiant Color in Oils by Susan Sarback, and Painting the Impressionist Watercolor by Lee Boynton. Please visit the Publications page of this website for more information. John's work has garnered many national and regional awards including, in 2009 - Best inShow at Paint Annapolis, Annapolis, MD ;2008 - Certificate of Excellence from the Portrait Society of America; 2007 - Second Place Ribbon at the Paint Annapolis Exhibition; 2004 - Jack Richeson Silver Brush Award for Best Figure Painting, awarded by Stephen Doherty, Editor in Chief of American Artist Magazine; and in 2003 - a Capital Region Emmy Award for Maryland Public Television's "Outdoors Maryland" segment "Shades of Winter". John is represented by McBride Gallery in Annapolis, MD; The Troika Gallery in Easton, MD;and Egeli Gallery in Provincetown, MA. 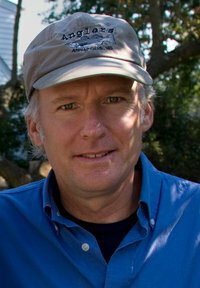 He is represented for portraiture by Portraits, Inc. in NYC. Notable collections include The United States Naval Academy, The Federal Reserve Bank of MD, Lockheed-Martin Corporation, and the First Bank of Alabama.